Toys Benefit Your Child Socially - Want To Know How? An important part of any child’s development is to improve their social skills. This prepares them for new situations they may encounter in childhood and also for adulthood when they must behave in a way that society considers acceptable. Toys play an important role in many aspects of social skills development. Although speech is often considered a separate skill, it is a vital part of your child improving their social skills. While speech is predominantly learned from parents or other people in close contact with the child, toys may also contribute to your child learning new sounds and increasing their vocabulary. Toys that have an audio element, such as talking books or dolls, are great choices if you want to encourage your child to improve their speech. People often categorize a child as sociable if they talk a lot, but the ability to listen is just as important to good communication. Therefore, learning to listen is an essential part of your child’s social skill development. Toys that play music and songs are great for helping kids to listen. Children also learn to listen when playing role play games with other children, such as dressing up or playing with dolls and dollhouses. As toddlers, children are often selfish and want to keep their toys to themselves. However, by the time they reach school, there is an expectation that they will understand the importance of taking turns and sharing. There are many different toys or games that will teach your child these skills. One of the best options is to buy board games for the family. Not only will this give you the opportunity to teach your child about taking turns, it is also a great way to spend time together as a family having fun. For very young children, simple ball games can help them to learn the basics of sharing and taking turns. Toys that have an element of recreating real life scenarios mean that children have to use their imagination and think of different scenes and situations they can act out. 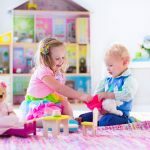 For example, if there are two or more children playing with a dollhouse, they will all want to input their ideas about the roles the dolls are playing and what activities they will do in the scenes they act out. People experience all types of situations in their adult life, but learning how to cope with each of these situations begins in childhood. Winning and losing is a good example of how children must learn to handle both success and failure, elation and disappointment. There are many toys and games that will put a child in a position where they may win or lose. This could be ball games, a skipping race or board games. Although many children enjoy playing alone, the ability to work well with others is important once they reach school age. When they reach adulthood, good teamwork is often a necessity in the workplace. Learning to work in a team from a young age can help your child to make good progress at school and also to develop friendships with other children. Any toys or games that require more than one person can help to develop teamwork skills. Some examples include sports, board games, and role play activities. Adhering to rules and conforming behavior are an expectation in society. Following instructions is important at home, in school and then within the workplace. From a very early age, children are given instructions frequently. In most cases, it is parents who give instructions at this stage of life; ‘eat your dinner’ or ‘put that down’. As they grow, children expand their ability to follow instructions from one simple request to a series of instructions to complete an activity. 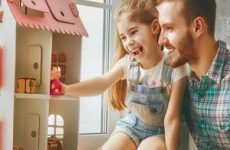 Interactive toys and any activities that require input from a parent are good ways of supporting a child’s development so they can follow a series of instructions. While the predominant purpose of most toys is to provide a source of fun and entertainment for a child, they can also play a vital role in many aspects of a child’s development. If you want to support your child in improving their social skills, then the majority of toys are useful tools in improving a child’s social skills. Looking for an awesome dollhouse? We’ve got you covered!